Visiting Drago’s Restaurant in New Orleans, my selection of this good red was less orthodox than a white might have been. I was actually in the mood for a Spanish red of some kind, smelling charbroil in the air, but their wine menu was brief and showed no real international options. 2010 Santa Barbara Winery Pinot Noir, Santa Rita Hills, California, USA. Most interesting about this meal is not the wine—which was enjoyable—but the hors d’oeuvres. For more than 40 years, Drago’s has been whipping together this KILLER dish. It’s fantastic, and I think it goes something like this: fist-sized oysters, charbroiled on the grill with butter, garlic, breadcrumbs(? ), and some Parmesan cheese all melted together. I had four of these before I knew what happened, not even minding the small pearl that I had to remove. With their smell in the air (more so than even the seafood), the red was actually on point. The oysters smelled like grill, like fire, like meat—and thus the 2010 Pinot Noir from Santa Barbara Winery was the real deal. Rich in taste, ruby in color, and both smooth and fruity on the palate. Alternating between bites of lobster and sips of this Pinot made for a pretty decent food adventure after a long day of trade show work. This Pinot Noir was good, but completely overshadowed by the oysters. Make those your priority instead. 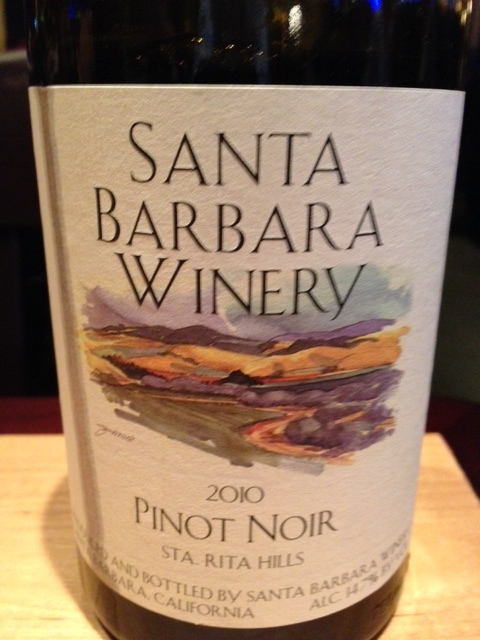 This entry was posted in Pinot Noir and tagged Santa Barbara County, USA.